The centennial of World War One will be commemorated in 2014, although the United States did not enter the war until 1917. Did you know that two million Americans volunteered for the Army, and nearly three million were drafted? For the first time over 30,000 women served in the ranks. Of these service men and women, more than 116,000 died and in excess of 200,000 were injured. Undoubtedly there will be many events taking place throughout the United States to educate people about the significance of this war, dubbed "The Great War". We are getting things started early in my town of Webster Groves. 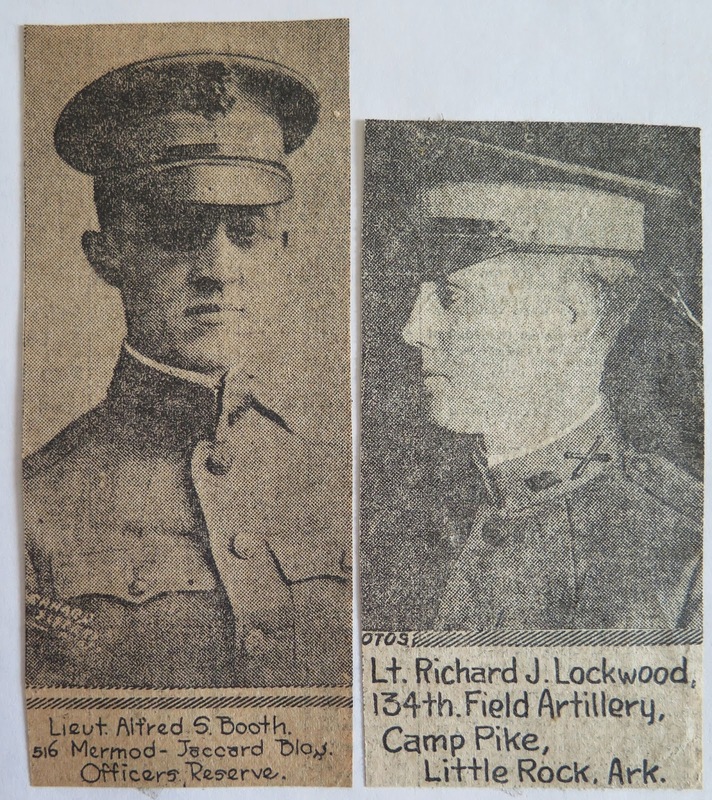 The local historical society is presenting an exhibit entitled, LIFE ON THE EVE OF WORLD WAR I. It opens on Sunday April 27th at the historic Hawken House, 1155 South Rock Hill Road, Webster Groves, MO 63119. For more information, visit the Webster Groves Historical Society website. 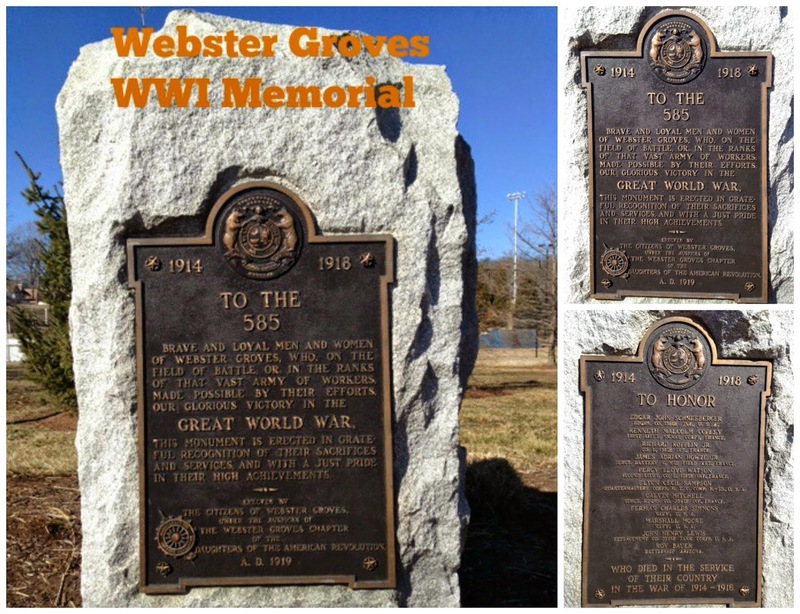 I have been helping in a small way by gathering up some information about a few of the local men and women who served in the war, and what was going on in Webster Groves to support the war effort. It was interesting to read newspaper articles from that time period, which offered suggestions on how the local people could provide assistance. Following the end of the war in November of 1918, the citizens of Webster Groves were quick to rally and take up a collection to erect a WWI memorial in the town. A letter soliciting donations was sent to every home in the Webster Groves School District (which was smart because the school district includes more than just the community of Webster Groves). The campaign must have been successful, because by May of 1919 the memorial was dedicated. One side of the memorial honors the eleven soldiers from Webster Groves who died in the war. I am eager to see all of the other items in the exhibit this weekend. If you are free on Sunday, stop on by! For Christmas my husband got me the Vitamix 7500. I'm not gonna lie - I wasn't too thrilled. And there is a reason that I don't play poker because if I am thinking it, my face is probably saying it. As soon as I opened the gift, he knew. Have you ever received a vacuum cleaner as a present? Or pots and pans? Yeah, it was kind of like that. Now don't get me wrong, we had talked about juicers - discussed the pros and cons like we do most things before we buy them. I was concerned about the amount of time it would take to chop things up prior to making anything in the machine, as well as the clean up involved. I do 95% of the cooking, so those things are a big deal to me. And quite frankly, we have a perfectly good smoothie maker. (Albeit one that is kind of a pain to clean.) So I wasn't completely sold on the whole Vitamix idea. Or the thought of receiving an appliance as a gift. In addition to the Vitamix, you get a Welcome Kit which includes the Owner's Manual, a Getting Started booklet and a Getting Started CD. I actually watched the CD and found it to be a waste of time as I had already read the Getting Started booklet, and the same material was covered in both. One feature that is pretty amazing on the machine is that it has a cleaning feature. Once you have finished making your drink, salsa, soup or whatever, you simply fill the blender jar (which is plastic, not glass by the way) half way with warm water, add a couple drops of dish detergent to it, and run the blender on high for 30-60 seconds. Easy, peasy cleanup! Yesterday morning I used the Vitamix for the first time. I made a smoothie to go with breakfast. I used an orange, 1/2 banana, 6 large strawberries, 1/2 cup grapes, 4 ounces of vanilla flavored Greek yogurt, a leaf of kale and 6 ice cubes. After blending for 30 seconds, the smoothie was ready to go. It made enough for two servings and was very tasty! I ran the cleaning cycle, rinsed out the blender jar, and set it on the dish drainer to dry. No worries about clean-up with this machine. I still had to plan for the time it takes to prepare the fruits/vegetables for blending, but I imagine that I will find ways to streamline that process. As this blender also allows you to make soup, I am eager to try that soon. In the meantime, here's to healthier eating! Anyone else using the Vitamix? Do you have any tips or recipes to share? We have been empty nesters for two years now, and I have to say we may have become a little set in our ways. Especially me, since the only thing I have to worry about besides myself all day is the dog. However, the past two weeks my fifteen year old niece from out of town came to stay with us. It took some adjustment on my part to adapt to having to think of someone else again. What does she like to eat? What would she like to do? whatever I cooked or where ever we wanted to go to eat out. We had a good time shopping, visiting the science center, planetarium, art museum, the Arch, Forest Park, Butterfly House, the Loop and other St. Louis attractions. She even indulged me in my current obsession with photographing the Cakeway to the West displays. She made an interesting comment about the St. Louis Premium Outlets center, stating that it was geared towards children and older people and not so much for teenagers. Hmmmm...interesting observation. I hadn't given that too much thought, but considering that teenagers spend 40% of their money updating their wardrobes perhaps the outlet mall needs to think about opening some retailers appealing to teens. She flew back home on Friday. While we very much enjoyed having her visit with us, it certainly made us appreciate the fact that our day to day parenting is over. It was wonderful to go through each of the stages with our two kids, but it is also fun to have come full circle to the family we became in 1978. The dog and I have settled back into our routine quite nicely.